Although not many applications need such structure of tabs in the same way a browser does, knowing how to do it can be useful. Using such a component can be pretty useful if you want to create your own embedded browser in your application or you work with some kind of design app that uses multiples canvas and the user can modify them. 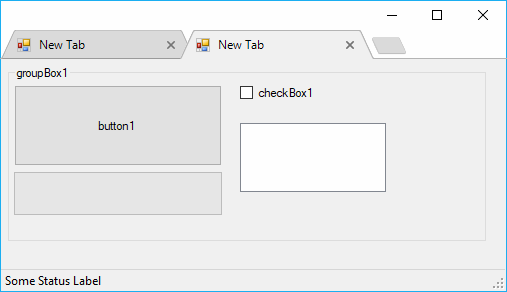 In this article we'll show you how to implement a Browser-Style tabs in your WinForms application in C# using the EasyTabs component. 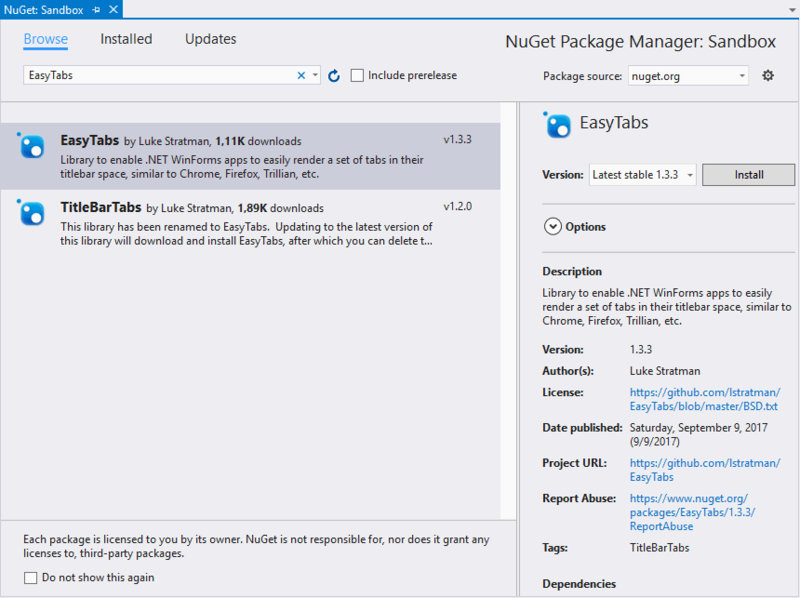 Select the first package namely EasyTabs by Luke Stratman and install it in your project. 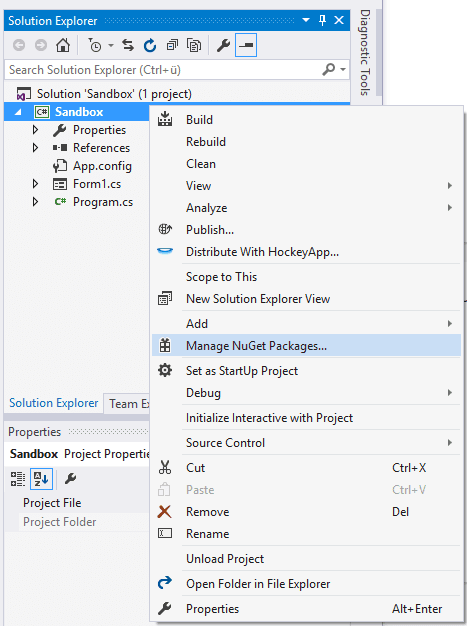 Once the installation finishes you will be able to use the EasyTabs namespace on your code. The tabs follow the principle, that every created tab will be an instance of a native Form, so the one that we will create namely Form1 will be the content of every created Tab. You can change this behaviour with conditionals on the next step during the creation of the AppContainer, however to make your app work quickly and understand how the library works, we recommend you to test it with a single and simple Form. Now this Form can be shown on a tab of the container. As next, you will need to create a new Form on your application that extends the TitleBarTabs UI. This form doesn't exist theoretically and can't be viewed alone, it just work as a wrapper for the tab(s) that will be appended later in the Entry Point of your application. 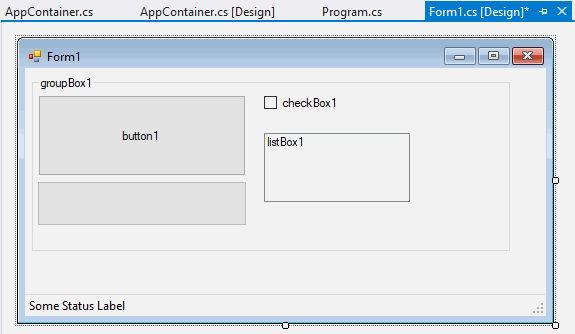 Its code content will be very simple and requires a simple thing, a method that allows the user to create a new Tab with another Form instance, in our example every created tab by the user will be an instance of the Form1 created in the previous step, this in order to test your application, you can change the content of the Form1 as mentioned later. The CS file needs obviously be a Form instance, not a simple C# class, otherwise the InitializeComponent method available on every Form won't be available and your code wont compile. This can be determined during the creation of the form using the assistant in the Solution Explorer area. You will get this error, because as explained, the designer is trying to draw something that is abstract (our form is abstract once extends the TitleBarTabs instead of Form), therefore an exception will be thrown only if you try to see the Form in the designer, otherwise is totally valid.